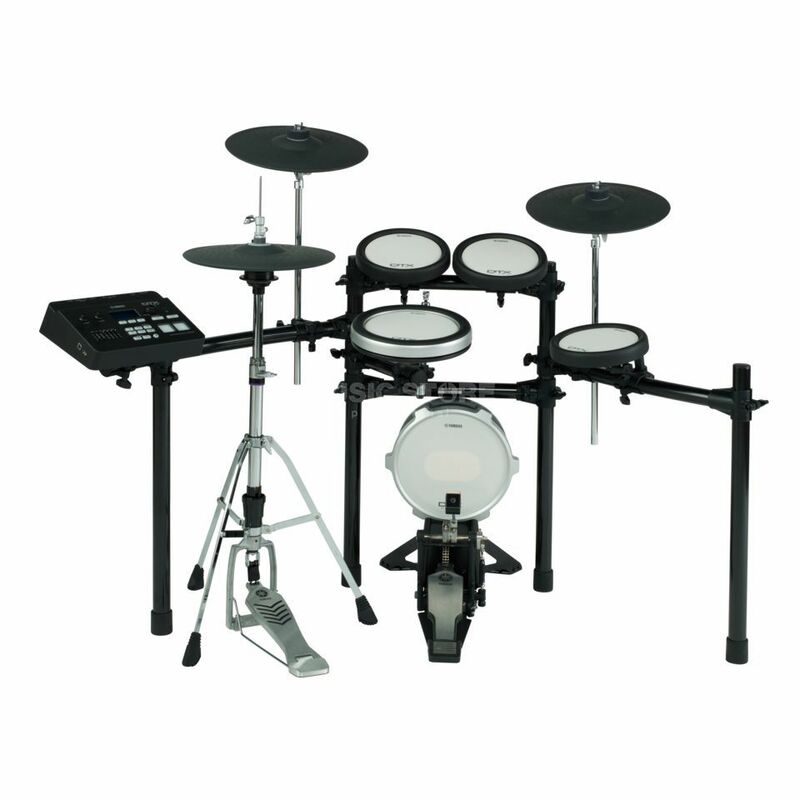 The Yamaha DTX720K Electronic Drum Kit is an electronic drum kit, that includes a module, a snare, two tom toms, a floor tom, a crash, a ride, a hi-hat, a kick, and a rack. The DTX720K features all DTX-PADs for the snare, toms and floor tom in a compact configuration. With a real hi-hat controller that mounts on the included hi-hat stand, plus the 3-zone cymbals, this kit provides great feel anywhere you play. The 3-zone snare pad can be precisely positioned with the ball clamp mount, and the kit can be expanded with up to three more pads. There are a total of 1,396 sounds covering a broad spectrum of instruments, including an essential selection of Yamaha acoustic drum sounds like Oak Custom series, as well as percussion and effect sounds. It also contains a wide variety of sounds from Yamaha’s Motif XF synthesizer. Used in combination with the DTX-PAD, the DTX700 module delivers even higher expressiveness and realism. This full-fledged hi-hat system consists of a pad that sets onto the supplied hi-hat stand; the same type of stand typically used in an acoustic drum kit. This hi-hat pad system can play both open and closed sounds as well as a foot splash. It also uses a 2-zone design consisting of edge and bow sections, which add to its realistic feel and playability. Using a USB memory device, it’s easy to import your favourite voices (WAV/AIFF) into the DTX700. Once in the device you can edit and assign the voices to pads to create your own, original drum kit. The DTX700 easily connects to a computer via any USB cable making it a great for recording MIDI data into a DAW or for playing a VST sound source. Steinberg’s Cubase AI is included with the kit so you can start creating music right away. Sampling Time * Mono/Stereo: 44.1kHz: 23 sec., 22.05kHz: 46 sec., 11.025kHz: 1 min. 32 sec., 5.5125kHz: 3 min. 4 sec.